What do you do when the one you love turns violent? Rich or poor, the dilemma is the same for every woman who experiences domestic violence. This story tells how one woman strives to build a new life for herself – at his expense! When young and lonely Erin McDonald leaves Newcastle for a job in Sydney shortly after her mother's death she meets high powered business mogul Giles Brightman. He sweeps her off her feet, and she is thrilled when he proposes. Madly in love she marries him, but she soon realises he wants nothing more from her than to look beautiful and be compliant – ready to accompany him whenever he wishes, charming to his business associates, a good hostess, and ready to accommodate him in bed whenever he feels so inclined. Slowly Giles' violent side emerges, and after an attack that makes her fear for her life, Erin knows she must get away. With little money of her own, and a platinum Amex card, she develops an audacious plan to give her a second chance in life – at Giles’ expense. But Giles won’t let her go easily. When she consults lawyer Aden Marlowe, she has nothing on her mind but business. She tries to ignore her attraction to Aden, and throws herself into her efforts to create a specialised high fashion boutique. Aden is captivated from the start, but he has a secret, and must hide his feelings while he and Erin work together to discover the secret of the seemingly innocuous Phoebus shares. Can Erin overcome all the setbacks to find a new life...and a new love? Full of courage and resolve, this is a story about reinventing yourself, and the intrigues of Fate. A story of love, friendship, disillusion and retribution as a woman strives to change her life. “Set in Far Northern Australia, Inheritance is an engaging romantic mystery. Highly recommended. I look forward to reading more from Kate Loveday.” Vicki Tyley, Australian Author. “A brilliant read. I could not put this book down and the end left me begging for more.” Sarah Cooke, Australian author. I love women-of-strength novels and that is one on of the things Kate Loveday does so well. When young and lonely Erin McDonald leaves her home for a new job shortly after her mother's death, she is vulnerable to the practiced machinations of the urbane Giles Brightman and falls completely under his spell. Young, inexperienced, and loving does not equal weak, her love holds up under his growing busy-man routine but when he crosses a line, she walks. 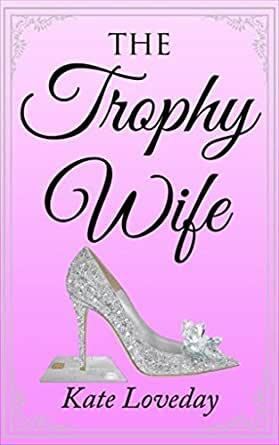 The tale of the rebuilding of her life, her soul, is the fascinating journey we travel the The Trophy Wife. The Trophy Wife, a novel by Kate Loveday, is the engrossing story of a marriage that goes bad and all that follows. Sadly, Erin McDonald did not realize that the man who swept her off her feet really only wanted her as his wife because of her beauty. She became a trophy wife in the truest sense. She was showered with luxury and for a time she was happy. Over time she realized something was wrong and she was right. Her husband's violence escalated and she had to leave him in order to survive. This well crafted story follows Erin as she struggles to forge a new life. There is a varied cast of characters, some admirable and others frightening. The secondary characters play important roles in the narrative and their stories are blended together perfectly. Many important issues, including spousal abuse, are prominent in the story. I found this to be a powerful and memorable book. Highly recommended.